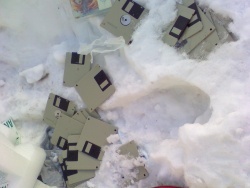 floppy disk & snow readymade earthwork by valerie brewer. thanks val! we wrote a story for you but our semantics keys are stuck (we spilled a sugary drink on our USB deep structuralinguistic input device).